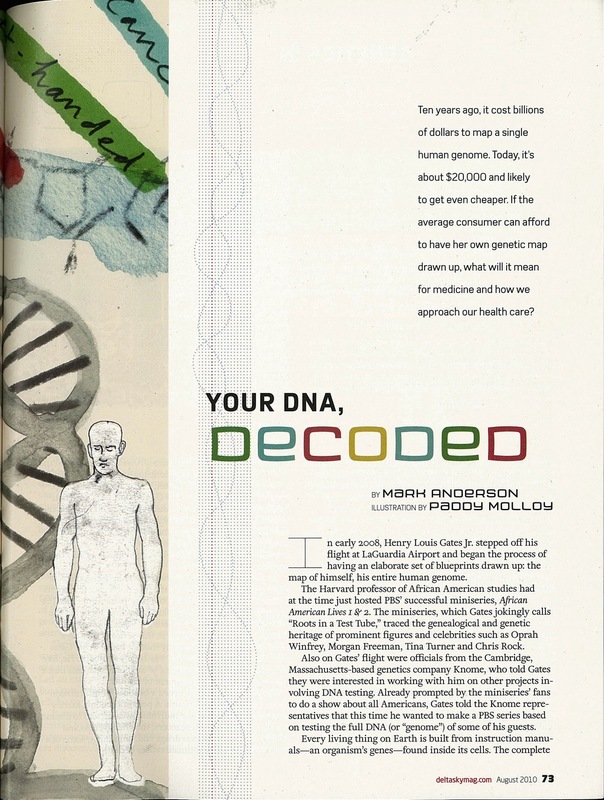 For the price of a sports car, you can have a pint of your blood drawn and a month later receive your entire genome—all 6 billion base pairs—encoded in a 1.5-gigabyte data file. That means the price has dropped to 1/50 000 of what it was less than a decade ago (the first genome, after all, cost US $3 billion). Yet the price is expected to fall to 1/1000 of the current price in the next four years. The cultural ramifications of a $100 genome—which is where we’re headed, whether it takes 4 years or 10—are as wide and deep as those of any other recent innovation, including search engines and cellphones. 4) A feature story for the Aug. 2010 issue of Delta Sky magazine, below. Click images to read text.